PC version launching alongside Switch version. Fate/Extella: The Umbral Star will launch for PC via Steam worldwide alongside Switch in North America on July 25, XSEED Games announced. The PC version will cost $49.99 / €49.99 / £39.99. The game itself will be sold at a 10 percent off launch discount, and all of the downloadable content at 20 percent off, from July 25 to July 31. The Switch version of Fate/Extella will cost $59.99 and includes over 30 previously released paid downloadable content costumes, along with the exclusive new “Unshackled Bride” outfit. In Europe and Australia, the Switch version will launch on July 21. 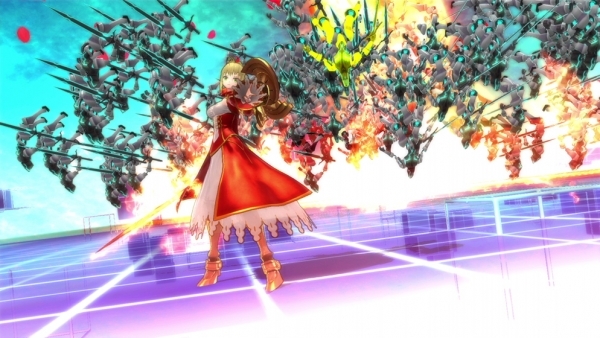 Developed by Marvelous Inc. and expanding upon the extensive Fate universe with an original story from acclaimed series writer Kinoko Nasu (of Fate/stay night fame), Fate/Extella features a diverse cast of 16 playable “Servants” – ancient warriors of legend and imagination, always at the beck and call of their Masters – who survived the Holy Grail War that took place on the Moon. In a future watched over by the all-powerful lunar super computer, “Moon Cell Automaton,” these champions now battle for dominance over this digital realm, known as “SE.RA.PH.” This story takes place after the events described in Fate/Extra, and depicts the world as it appears following that previous Holy Grail War. Players will experience the story of Fate/Extella from the independent perspectives of the three factions wrestling for control over SE.RA.PH. and face off against foes from a variety of Fate productions, including characters from Fate/Extra, Fate/stay night, Fate/Zero, Fate/Apocrypha, and Fate/Grand Order, in fast-paced combat. A new form change battle mechanic called Moon Crux debuts in this entry to match its series-first gameplay style, transforming the player-controlled Servants and granting them considerable powers that allow them to devastate enemies and take formidable challenges head-on. The game will contain the original Japanese voices, with the Nintendo Switch and Windows PC versions featuring game text in English, Japanese, Chinese (Traditional), and Korean. Fate/Extella is developed by Marvelous Inc. and is published in North America by XSEED Games. In addition to standard retail and digital formats for the Nintendo Switch version, the game is available on the PlayStation 4 and PS Vita systems in a limited Noble Phantasm Edition bundle, which contains a 7.5” by 6.3” hardcover art book featuring over 100 pages of high-quality artwork and backstory from the Fate/Extella universe, a pack of sixteen collectible 3” by 5” cards depicting each of the game’s Servants, and a 24” by 17” cloth poster, all housed in a custom collectible box. The PlayStation 4, PS Vita system and Nintendo Switch versions of this title have been rated “T for Teen” by the ESRB. The Windows PC version of the game is not rated by the ESRB. Fate/Extella is currently available for PlayStation 4 and PS Vita. View a new set of screenshots from the PC version (images #1 to #18) and Switch version (images #19 to #23) at the gallery.